Max elevation: 209 ft.– total elevation gain approximately 172 ft. The McAndrews Estate (also known as Reusens Farm or Long View) is part of Oscawana County Park, located in the Crugers area of the Town of Cortlandt in northern Westchester County, New York. Once a large working farm and estate, it is now unincorporated park land and contains a number of ruins. The land was originally owned by Nicholas Cruger, and later by a group of individuals including R.A. Wilkinson, Catherine and Gilbert R. Fox, Henry DeGraaf, Warren Leslie, and several others. By the 1880’s it had been acquired piece by piece by Guillaume A. Reusens, a businessman of Belgian ancestry who bred racehorses. Reusens Farm was maintained and sustained by Guillaume Reusens and his descendants for 70 years. On January 5, 1915 at age 70, Guillaume Albert Reusens passed away. The property was inherited by his nephews, brothers Stanislaus P.M.C. De Ridder and Eugene De Ridder. Eugene De Ridder died under suspicious circumstances only a year after his uncle on April 2, 1916. A lengthy legal dispute over the estate ensued and it’s not clear when (estimated 1922), but eventually Stanislaus De Ridder won his estate claim and became the sole owner of Long View. On March 7, 1934 Stanislaus De Ridder passed away in NYC. He left no will and the estate reverted to his wife Anne. At some point afterward, Anne married Martin McAndrews. Very little is currently known about the early McAndrews years. Anne McAndrews died on September 20, 1948. In 1962 Martin McAndrews moved away permanently, and the property fell into serious disrepair. At some point after that, the property was vandalized and burned. By 1965 Westchester County moved to condemn the property, which it did four years later in 1969. Not long after, under the County’s Orders, the deteriorating structures on the property were demolished. Over the next 40 plus years, nature reclaimed what had once been open fields, obscuring what must have been stunning views of the Hudson River. The stone ruins of a few buildings have slowly started to crumble and have become overgrown with vegetation. Oscawana County Park is owned by Westchester County and managed jointly via an inter-municipal agreement with the Town of Cortlandt. The 100-acre park is open to the public, and contains a number of ruins and hiking trails. Some of the trails are blazed and relatively easy to follow. The trailhead is located on Cortlandt Street across from Oscawana Island Nature Preserve, where parking is admissible. There are additional access points along the southern edge of the park on Furnace Dock Road as well. Oscawana Island Nature Preserve’s parking area can accommodate quite a few cars, with the trailhead and kiosk just across the street where Furnace Brook flows beneath the road. The first time I visited McAndrews Estate, I had no map and kind of just wandered around. There were several areas that I had missed on my previous visit, so I wanted to make sure I covered them on this trip. A lot of the exploration is off trail, but with the leaves down and a mostly open forest, points of interest are easy to find. Having a map this time made it much easier to find my way around and figure out the purpose of the many structures that are scattered throughout the property. Instead of entering at the trailhead with the kiosk, which would be the way I exited, I instead walked south, up Cortlandt Street, about 300 yards, past a stone wall. A short distance later, there is an old road that leads into the estate, with large stones at the entrance. This road is the old Cruger House Driveway. Below is an image of what it looked like circa 1900. I walked up the old road and almost immediately came to an old concrete structure. I am not sure of its origin or purpose, but it could have been a storage building or an ice house. It is not listed on the map. As the road passes the concrete structure, the White Trail comes in from the left as white blazes begin to appear on trees. A short distance on the White Trail, there is an unmarked footpath to the left, that leads through the woods. The trail passes by a foundation with stone steps. This is what’s left of the “Johnson House.” It was one of four houses on the estate. It is named for the Johnson family who lived in it during the time of Guillaume Reusens. Originally a two-family house, it was converted to a single family dwelling and renovated by the McAndrews family in the 1940’s. Just up ahead is the stone retaining wall for the racetrack. The Racetrack was once used to exercise the prize horses that were housed on the Estate. Walking north along the south leg of the racetrack. The south leg of the racetrack with the arched stone wall and cow barn visible in the distance. This photo was taken in 1911 by E.E. Ballard and compiled into an album by Lynn Stevens in 1964. At the eastern end of the racetrack, just to the right, is the cow barn. One of the most well-preserved ruins on the estate, this impressive stone stable was used to house cattle. The Cow Barn housed cows on the upper level, and occasionally sheep down below. To the left you can see the race track and in the distance the De Graaf/Powers House. It is the only structure known to have been built (in 1907) by Guillaume Reusens. The circular hole is where the silo used to be. The sheep were housed on the lower level. This is the northern leg of the racetrack. The racetrack is bordered by metal pipe fencing. There are miles of metal pipe fencing throughout the property. In the middle of the race track close to the northern loop, was a two-story Judges’ Stand. Presumably it was used to judge horse races or assess training activities. Below is an image of what it looked like in 1968. Continuing on the northern leg of the racetrack, to the right is a brick reservoir. The Racetrack Reservoir stored water, and was connected to the De Graaf/Powers House located downhill to the east. A large Northern Red Oak near the race track reservoir. Exiting the racetrack, the same way I came in, I headed west through the woods. The stone foundation of the Cruger house is just ahead. The Cruger family gave us two Mayors of New York City (one of whom was the host for the Stamp Act Congress), early New York’s most successful merchant trader (who built the largest wharf there), a man who gave Alexander Hamilton his first job, a brave Loyalist who fought in South Carolina, and a man who was actually an elected member of the House of Commons when war broke out and later returned to the newly created United States, to serve as a New York Senator. Its large footprint gives an idea of how big a house once stood here. This house was uninhabited as far back as the early 1900’s. It was still standing in the time of the McAndrews, but burnt by vandals in the 1960’s after the property was abandoned. The Cruger house foundation is just off the White Trail, opposite the concrete storage building. Back out on the White Trail, turning left and heading southeast. I turned right on the Orange Trail as it heads south through the woods. 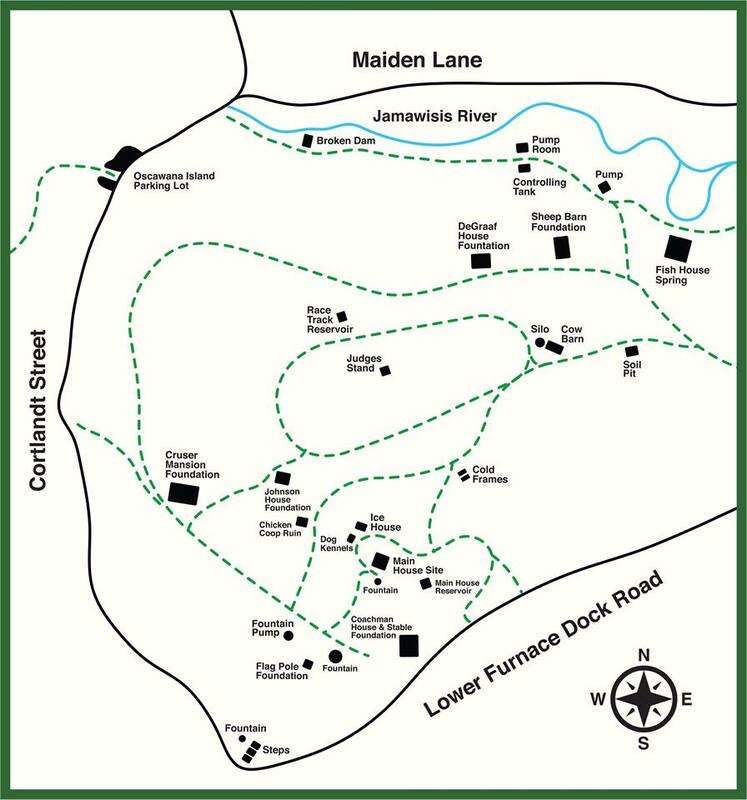 In about 500 feet, the Orange Trail ends at lower Furnace Dock Road/upper Cortlandt Street. This was once the main entrance to the Cruger estate. Main pedestrian gate at foot of Furnace Dock Road on the southwest corner of the estate. I turned around and walked the stone steps back up the Orange Trail. I retraced my steps along the Orange Trail and turned right as it reaches the junction with the White Trail. A short distance ahead, to the right of the Orange Trail, is a large wrought iron fountain. Looking north and from the vicinity of Furnace Dock Road. In the distance is the Main House. To the right, the large fountain and flag pole. Almost directly across from the fountain is the start of the Yellow Trail. The Yellow Trail heads north through the woods towards the main house site. The Yellow Trail climbs stone steps, just to the left of where the main house once stood. The large stone walls are visible just to the right of the trail. The main house in a vintage photograph. The ruins of the retaining wall and steps that once sat in front of the large main house overlooking the Hudson River. Close by are the ruins of a brick reservoir. Located just east of the main house. The base of the structure, a reservoir that stored water for the main house. The upper level was used as a gazebo. I made my way back to the Yellow Trail and passed cellar holes of a dog kennel and an ice house. I then left the Yellow Trail and walked a short distance west, crossing over the White Trail. The remains of what was once a chicken coop, just below where the Johnson house was. Now back on the White Trail as it heads northeast. The White Trail then closely parallels the racetrack and approaches the stone cow barn and curves to the right. A short distance ahead, after passing the cow barn, is another stone structure on the right. Known as the “Soil Pit,” this rectangular structure was used to collect manure (via underground pipes) from the Cow Barn. The White Trail ends at a T-intersection with the Blue Trail, where we turned right, now heading east. Through the trees, a pond is visible that was created by damming Furnace Brook. The eastern leg of the Blue Trail ends at the upper section of Furnace Dock Road. Retracing my steps on the Blue Trail, I turned right after passing the pond and began bushwacking north. Just ahead is a dam waterfall, with Maiden Lane on the other side of the brook. I Retraced my steps back to the Blue Trail, turned right and passed the junction with the White Trail and veered right to stay on Blue. The Blue Trail descends steadily as it heads northwest. At the base of the descent, the Blue Trail turns left, but I continued ahead towards the edge of Furnace Brook and turned right along the shore. Just ahead, past a downed tree is the Fish House Spring. The Fish House Spring was a structure and complex located on the north side of the estate that at one time featured a large concrete patio, brick walls topped with iron security fencing, and a small square building that is believed to have been involved in regulating the fresh natural spring water which was collected at the site. Below is what’s left of the brick wall along Furnace Brook. In addition to being a source of pure water for the various owners of the property, there is strong speculation that a Carp Farming business was managed at this location by Garret De Graaf, who owned the property during the late 1800’s. On the way back to the Blue Trail, the ruins of an old pump that used to send water up the hillside. Now heading west on the Blue Trail. Looking west from atop the ruined dam. The ruins of an old stone dam alongside the trail. The kiosk near the end of the Blue Trail near Cortlandt Street. The Blue Trail ends at a gate on Cortlandt Street. This is also the main trailhead. This is a really easy hike that has so much to see. It was fun discovering new points of interest that I missed on my last visit. I saw a pair of elderly men at the parking area, but no one else the entire time I was there. Truly worth a visit if you enjoy historical ruins and a quiet woods walk. This hike can be done in conjunction with Oscawana Island Nature Preserve, which has trails totaling about 1 mile with views of the Hudson River. Pros: Historical features, ruins galore, lesser traveled area. I always enjoy all your detailed descriptions of your hikes – especially the pictures! I have gone on a few of your hikes after reading your blog… Thank you so much for putting it all out there!! Thank you Amy, I’m glad that you enjoy the blog and find it useful. One of my favorite places to return to see new things. Your blog is awesome. Keep it going.